Whether you are looking for a weekend escape or a short religious trip, Haridwar and Rishikesh are two destinations that are absolutely the right choice. This exclusive holiday package consists of 2 nights and 3 days abode in Haridwar, the 'Gateway to the Gods'. Here you will get to be the part of the divine Ganga Aarti at Har Ki Pauri, go river rafting in Rishikesh and visit various ancient temples of the places. So, don't think anymore, book this tour now! Located at a distance of 35 KM from Jolly Grant Airport, 1 KM from Haridwar Junction railway station and just a stone throw away distance from the local bus stand, this 2 star hotel fulfills almost all the needs of a budget traveler. The hotel has a total of 21 rooms in A/C and non A/C category. Its multi cuisine pure vegetarian in-house restaurant serves a range of Indian, Chinese and Mughlai delicacies for satisfying the guest's taste buds. Get transfer to Haridwar (by car) and check-in at the hotel on arrival. Relax for a while and proceed for an evening visit to Har Ki Pauri to witness the Aarti of Goddess Ganga. Overnight stay will be at the hotel. Enjoy an early morning breakfast and proceed for an excursion trip to Rishikesh paying en-route visit to the famous Triveni Ghat & temples. 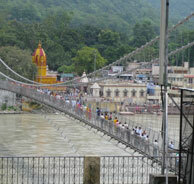 In Rishikesh, you can various attractions like Lakshman Jhula, Neelkanth Mahadev Temple etc. You can also enjoy river rafting (on direct payment basis). Return to the hotel in Haridwar for night stay. After having leisurely breakfast, get driven back to Delhi to proceed for onward journey.